Sounkyo, a popular destination for sightseers, is located in Kamikawa, Hokkaido, about a 90-minute drive from Asahikawa Airport. It is next to the entrance to Japan’s largest national park, Daisetsuzan National Park. You can enjoy the beauty of the gorge during all four seasons, but we especially recommend it during the period of the autumn leaves. Spanning over 24 km(≒14.9 miles), the gorge with its pillar-shaped precipitous cliffs was created by “columnar jointing” during an eruption approximately 30,000 years ago. It is dotted with several spots where you can see the autumn leaves. 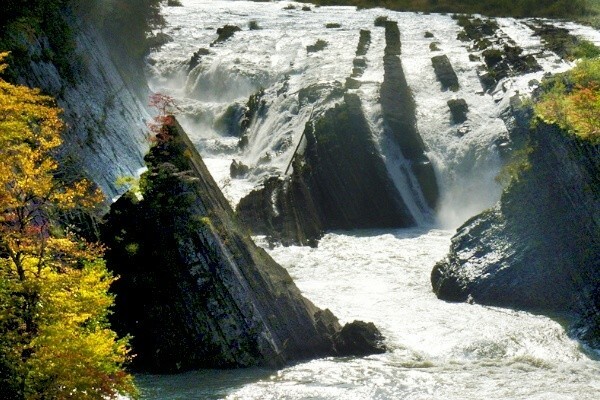 These falls are also known as “The Male Waterfall・The Female Waterfall”. 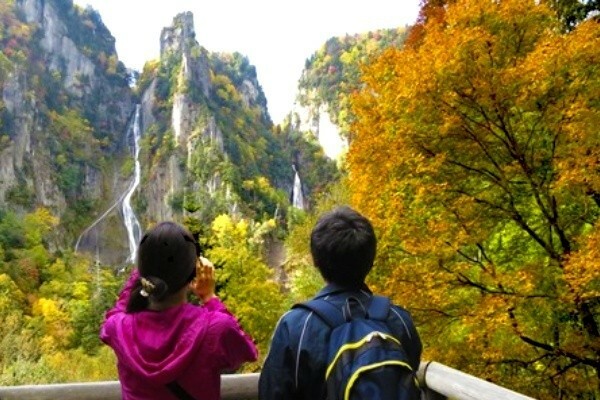 You can enjoy the contrast between colorful trees and these falls during the period of autumn leaves. If you climb up the mountain trail for about 20 minutes, you’ll reach the Sobakudai viewpoint, where you can see the “Husband and Wife Falls” at the same time. About 10 minutes walk from the hot spring town of Sounkyo, this hiking trail runs alongside the stream and is approximately 700 m(≒0.43 miles) one way. 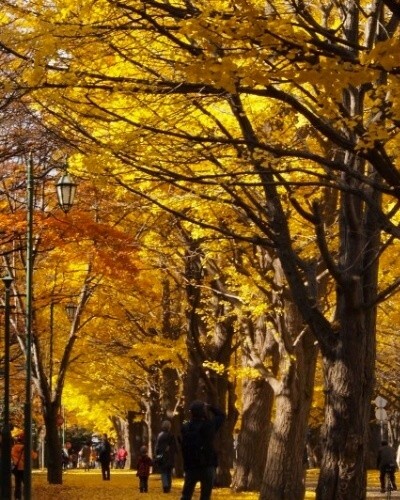 It is famous for its Japanese maples during the period of the autumn leaves. 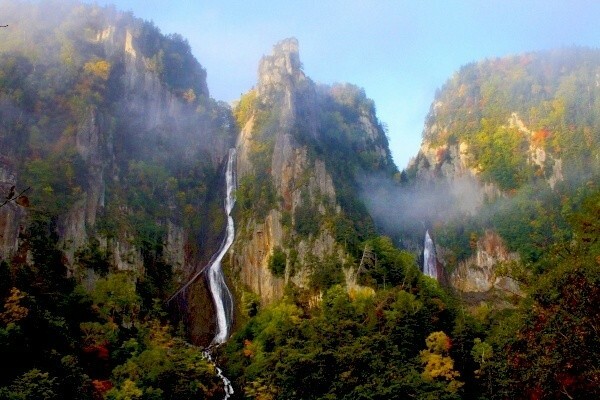 You will arrive at Momiji Waterfall while walking approximately 30 minutes one-way while enjoying a superb view of the Sounkyo Gorge. Please be careful that he path has some ups and downs. Magnificent views! Picturesque scenery from the ropeway and lift! From Sounkyo’s Sanroku Station, the ropeway that can hold 101 people brings you on an approximately 7-minute ride. While you view the gorge and autumn leaves below you, it brings you to Mount Kuro’s 5th station at an altitude of 1300 m(≒4265 ft). Mount Kuro’s 5th station has a restroom, gift shop, even a museum. From the viewing platform, you can, of course, see the autumn leaves, but if you’re lucky, you might also meet a cute Siberian chipmunk. Furthermore, if you change lifts at the 5th station, you can go to Mount Kuro’s 7th station at an altitude of 1520 m(≒4986 ft). 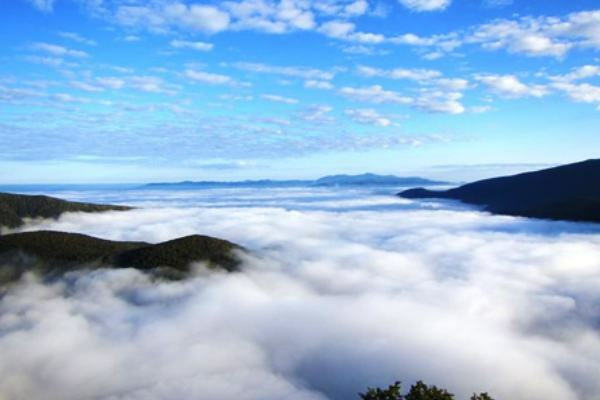 Superb views of a sea of clouds and autumn leaves from “Ohayo Ropeway”! 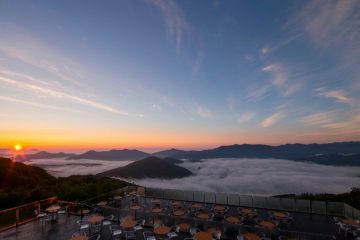 Between the end of May and the middle of October, the ropeway service begins at 6:00 A.M. On a clear day, you can gaze down upon a magical sea of clouds. On this tour, a knowledgable nature guide can tell you all about the formation of Sounkyo, the plants and animals of the 5th station, and more. 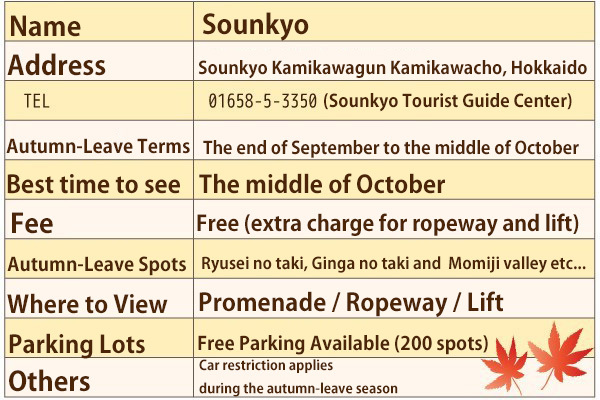 In addition, there is an abundance of other Rinyu tours in Sounkyo that allow you to enjoy the autumn leaves. 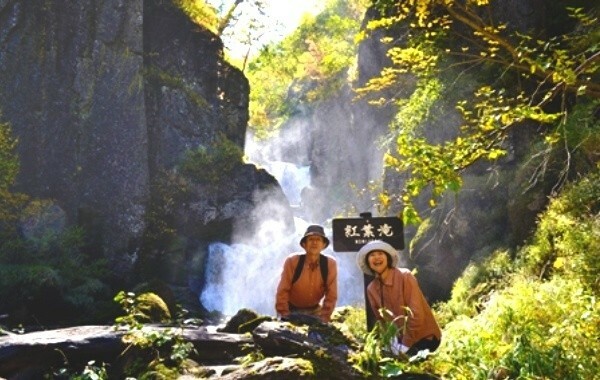 There’s “Momijidani Trekking” until the beginning of October, where you can walk through Momijidani with a knowledgable guide. There’s also “Gorge Cycling”, where you can bike through Sounkyo with a guide. There are several tours you can enjoy, no matter who you’re with. Please check it out if you’re visiting Sounkyo. Superb views of the autumn scenery from Mount Aka’s Ginsendai! 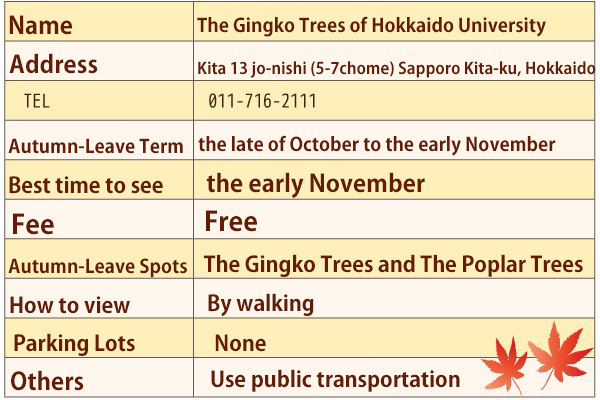 There are even more autumn leaves to see in the Sounkyo neighborhood! A 40-minute car ride from Sounkyo, the autumn leaves at Mount Aka’s Ginsendai trailhead are indescribably beautiful. 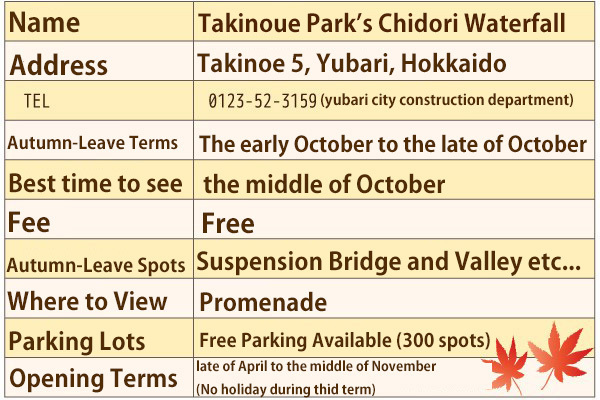 There are private car regulations in the Sounkyo area during the period of the autumn leaves. If you’re going to be visiting in a private car or rental car, please reference the following access data before making plans. 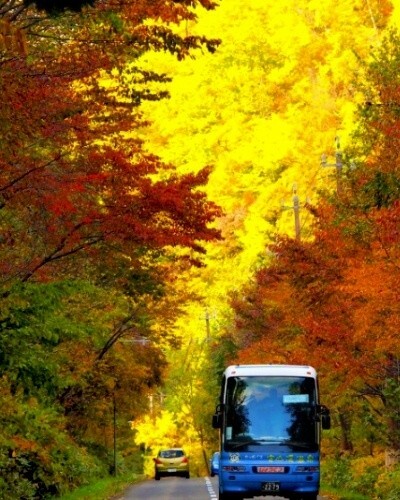 ※There is a car limit during the fall-leaves season　Please click here for detail. 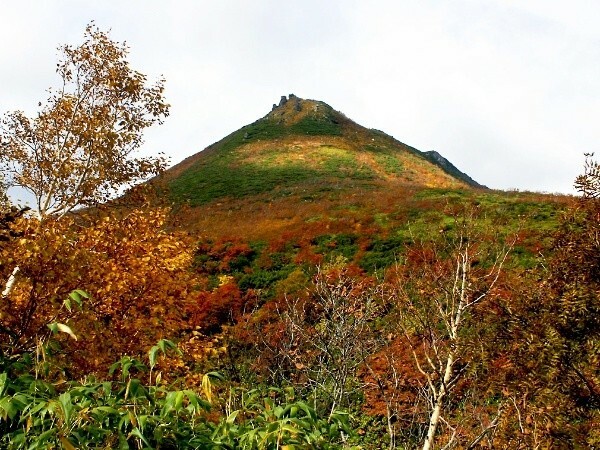 Mount Asahi, at an altitude of 2,291 m(≒ 7516 ft), is located in Japan’s largest park, Daisetsuzan National Park. 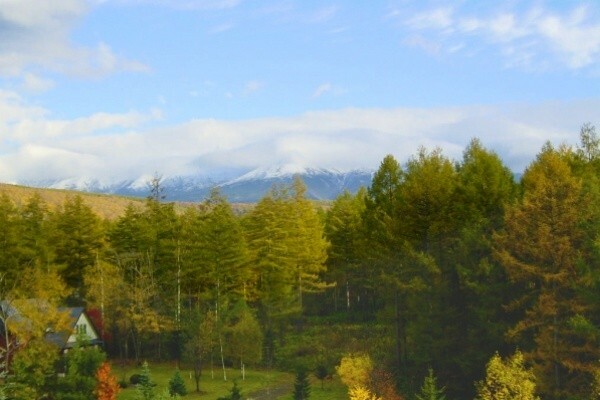 It’s famous for being the tallest mountain in Hokkaido, as well as the mountain in Japan where it snows for the longest period of time and the snow lingers longest. In addition to these famous accolades, Mount Asahi is also the spot where you can first experience the period of the autumn leaves in Japan. 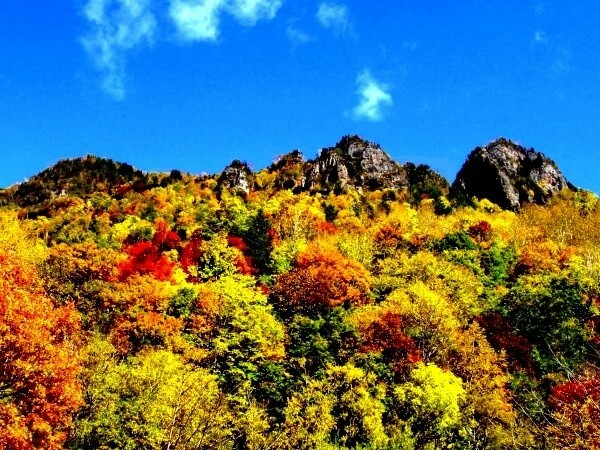 The autumn leaves generally start to appear around the end of August, the mountain is covered, from summit to base, in autumn scenery in about a month’s time. 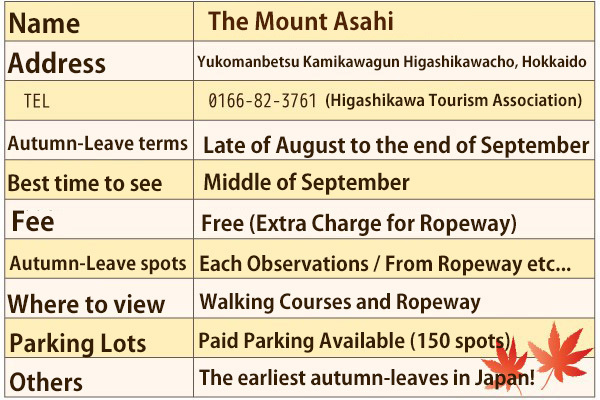 To see the earliest autumn leaves in Japan, we recommend the Asahidake Ropeway. There is also a hiking trail that is completely bustling with tourists by the middle of September. 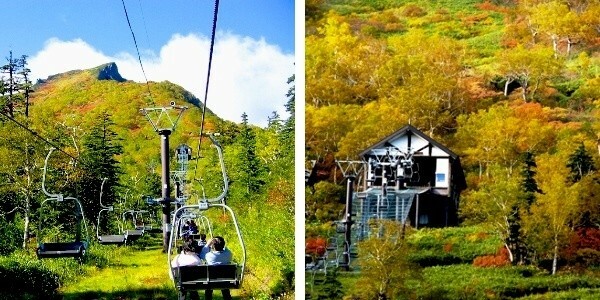 ・Be deeply moved by the autumn views below the ropeway! 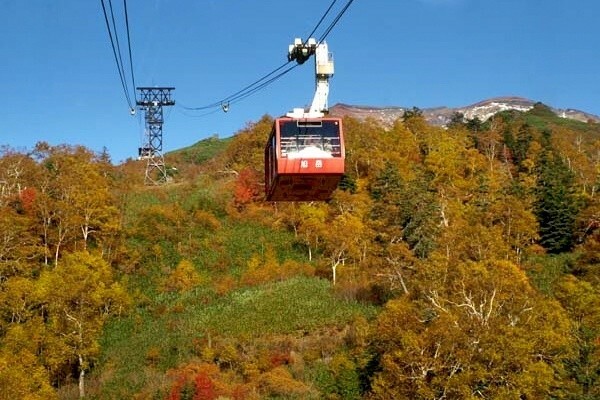 Enjoy the scenery from Asahidake Ropeway during the 10-minute sky walk between Mount Asahi’s Sanroku Station (approximate altitude 1,100 m≒3608 miles) and Sugatami Station (approximate altitude 1,600 m≒5249 miles). 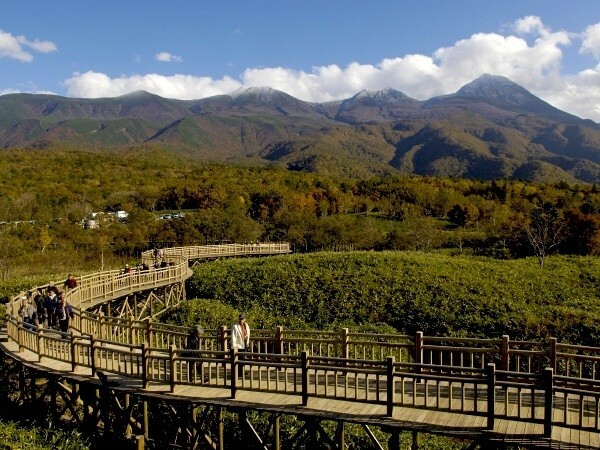 You can also enjoy walking on the Sugatami round-trip course, a total of 1.7 km(≒1.05 miles). 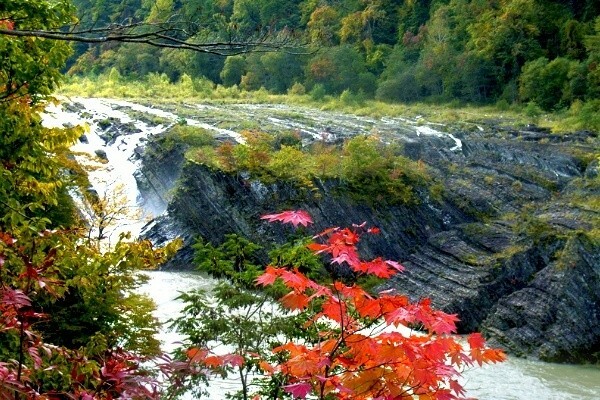 Takinoue Park’s Chidori Waterfall is famous for its picturesque autumn scenery. 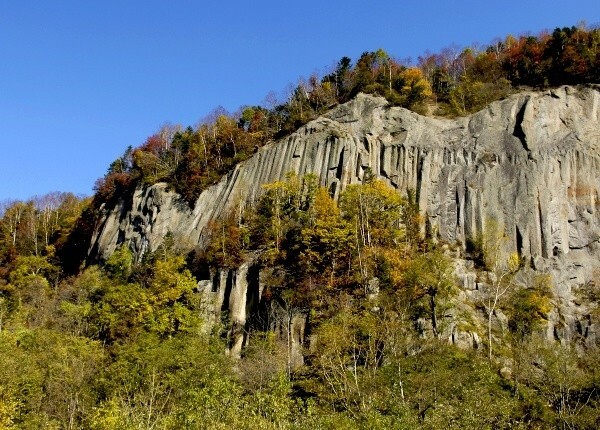 It’s located in Yubari, a popular sightseeing destination that’s about an hour drive from Sapporo. By train, you can take the JR Sekisho Line, and then it’s an accessible 5-minute walk from Takinoue Station. This park is called “Ponsoukamuikotan” in the Ainu language. 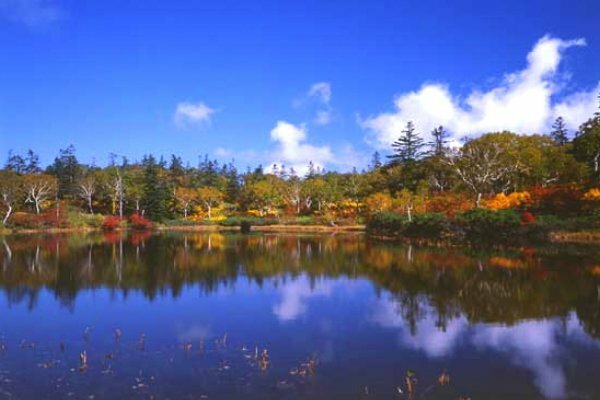 You can gaze at beautiful Ryusen Valley and experience the scenic power of Mother Nature in the park. ※Ainu language is a language that has been passed down for generations in Hokkaido from the Ainu aborigines. 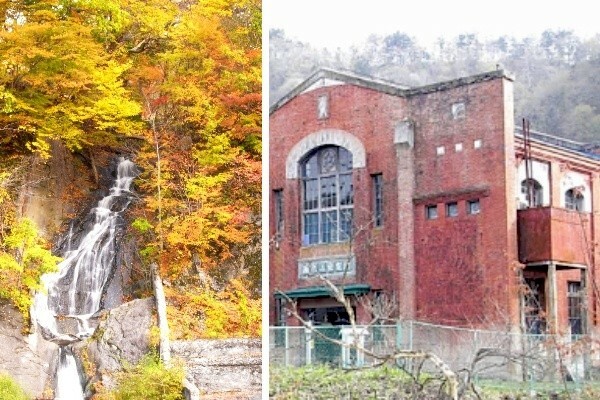 There are full of excitement in the park like a suspension bridge, a promenade where you can enjoy walking through the autumn scenery, the Takinoue Power Plant that was built in 1925, and the waterfall. 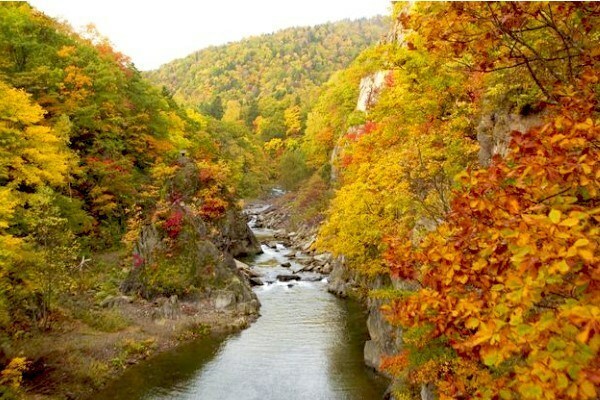 It’s especially famous for the beauty of its autumn leaves. During the period of the autumn leaves, there aren’t enough words to describe the beautiful sites that you can see. 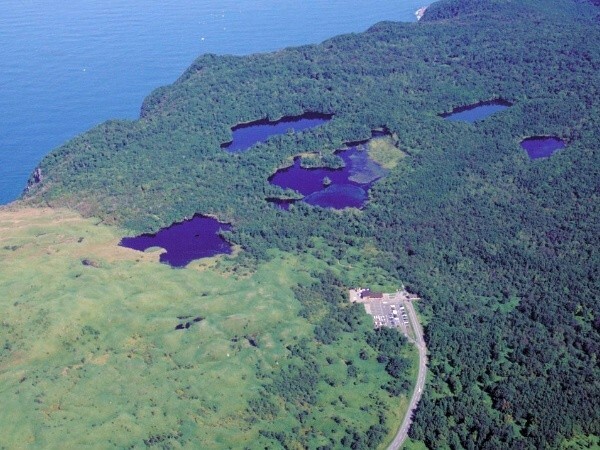 Onuma Quasi-National Park, which has been selected as one of the new Three Great Views of Japan, is located in southwest Hokkaido in the middle of Oshima Peninsula. It’s a nature park spanning an area of approximately 9,000 ha. 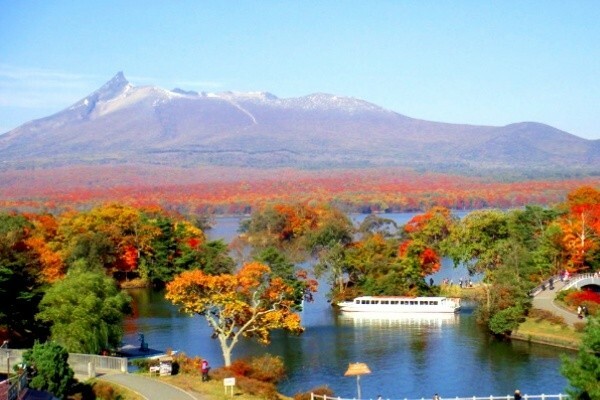 Promising locations inside the park include the active volcano Komagatake, the Onuma, Konuma, Junsainuma lakes which are surrounded by a large forest and dotted with more than 100 small floating islands. 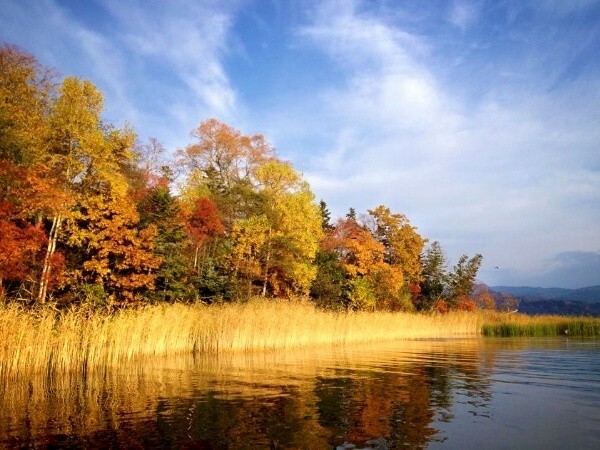 The beautiful contrast between the lakes and the autumn leaves on the surrounding trees will take your breath away! 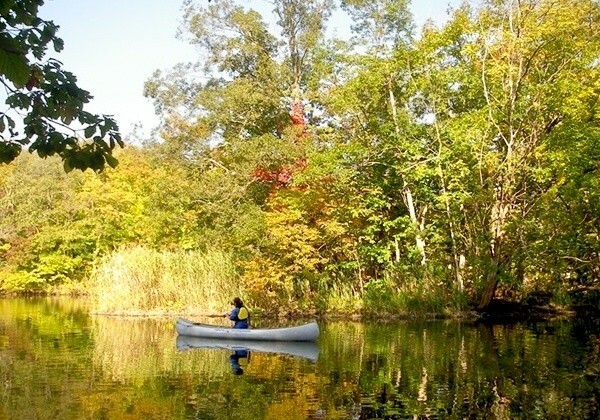 Inside the park, you can partake in various activities such as canoeing and cycling. You can take a whole day to fully enjoy the autumn scenery. 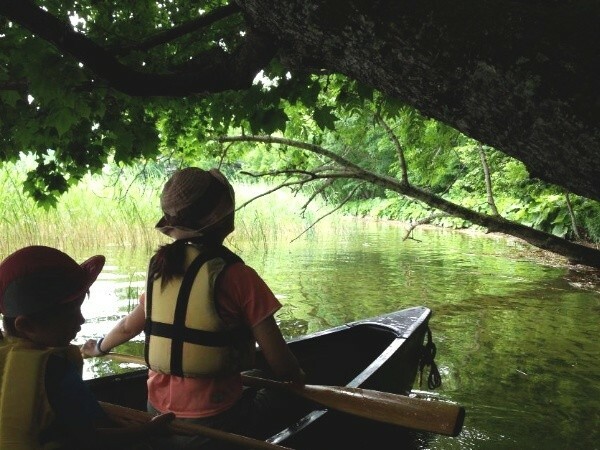 You can take a leisurely canoe ride on the Onuma and Konuma lakes. Gently rowing the canoe is a thrilling experience, different from anything in your daily routine. And then, when you look out, the picturesque autumn scenery spans 360°. This kind of experience is once in a lifetime! Try combining activities you wouldn’t normally do with spectacular views to make the best memories on your trip. 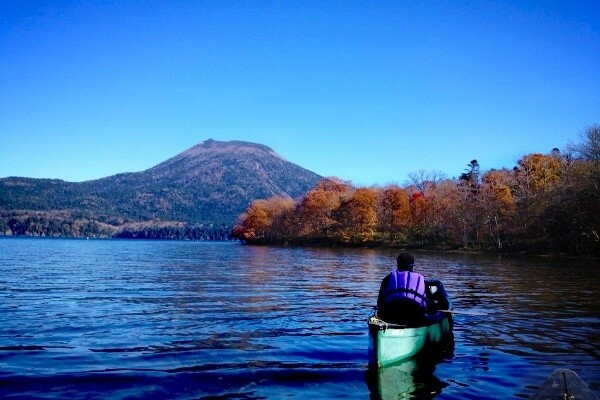 There are even more ways to enjoy the enticing Onuma and Konuma Lakes from the surface of the water. 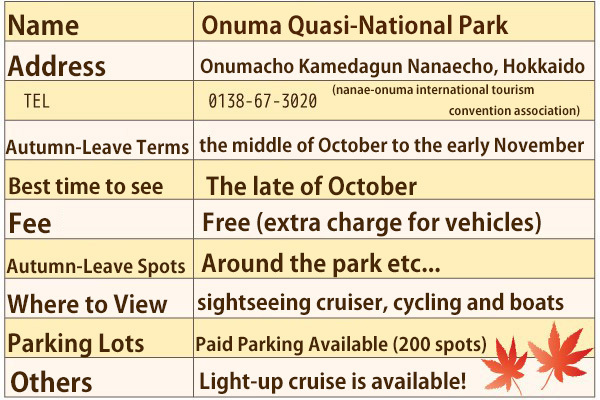 With the Onuma Yusen Co. Cruising Plan, you can choose from different options depending on the number of people in your group and other circumstances. 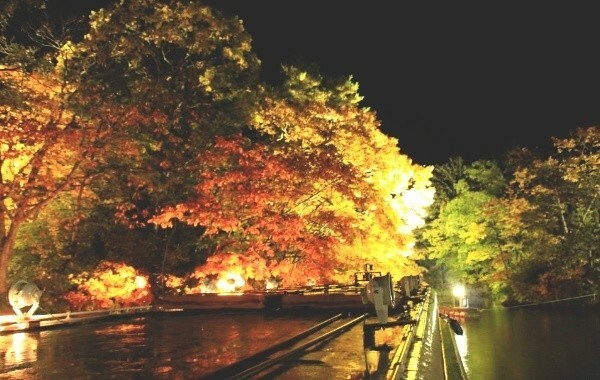 The “Autumn Leaves Light Up Cruise” runs along at night in a magical ambiance in limited terms. 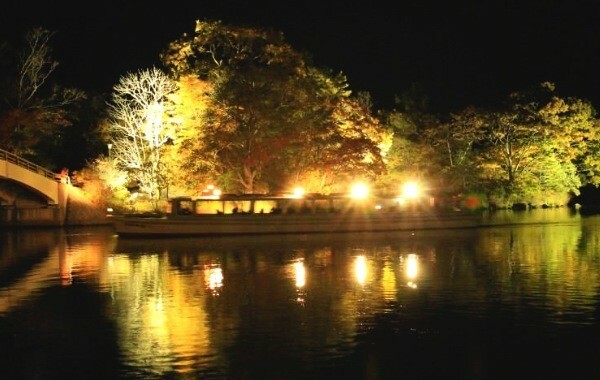 Viewing the autumn leaves from the cruise ship at the perfect magical and elegant activity for adults as it gently drifts across the lake at night. (the Light Up Cruise requires a reservation). 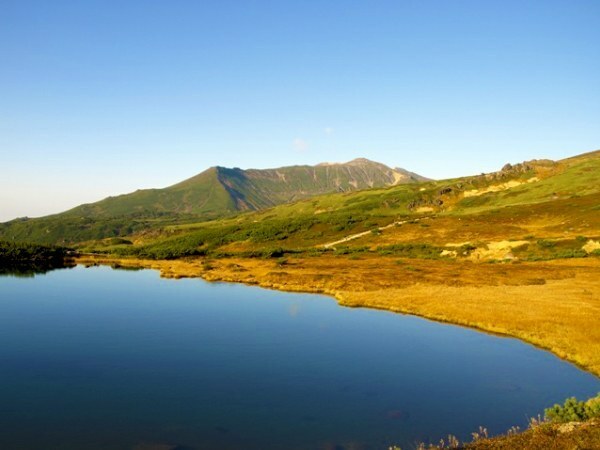 The Shiretoko Five Lakes are located in the center of Shiretoko Peninsula along the Okhotsk Coast. 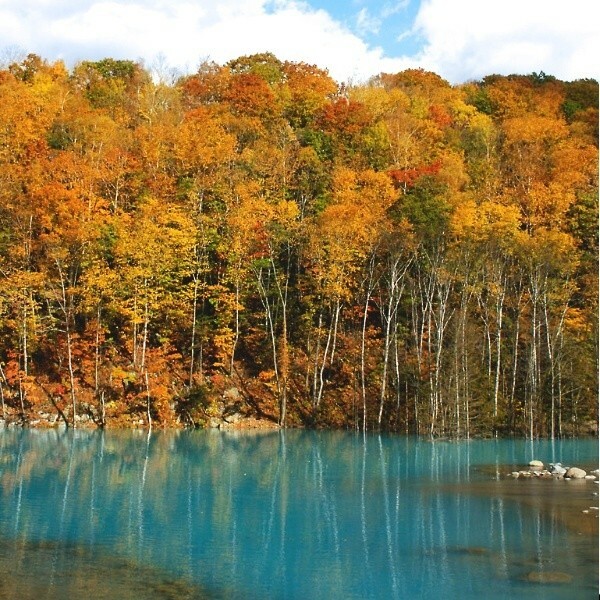 As the name implies, there are five lakes, 1 through 5, in the town of Shari, Hokkaido. 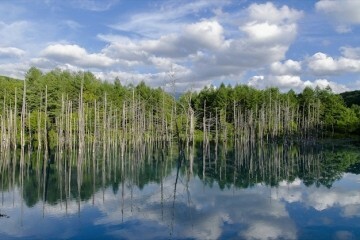 At an altitude of about 250 m(≒820 ft), the Five Lakes are encompassed by a sparse virgin forest. 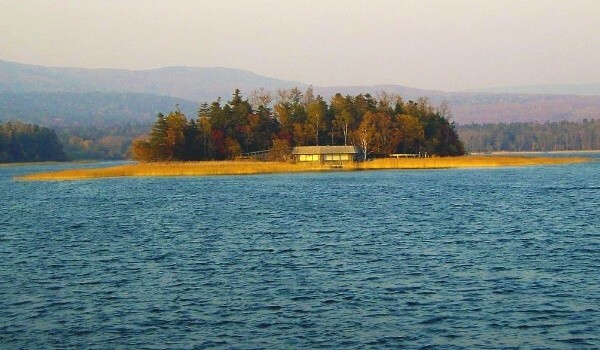 The lake surfaces reflect the mountains and surrounding scenery of the Shiretoko Peninsula. The autumn leaves here are beautiful and famous. In addition, Shiretoko is also famous for being a brown bear habitat. 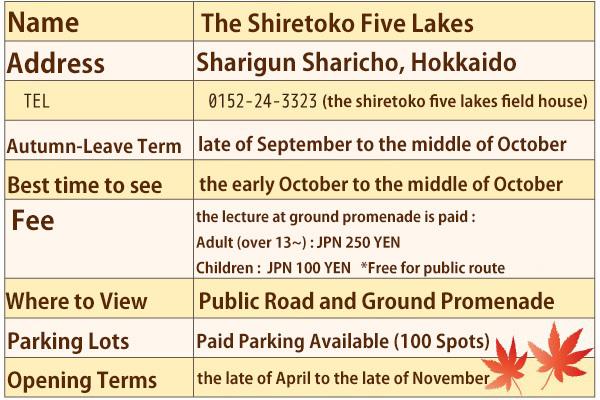 While sightseeing, you can receive a lecture at the Shiretoko Field House, or you can follow a predetermined tour route. Let’s safely enjoy the autumn leaves. The elevated boardwalks, with a total length of 800 m(≒0.49 miles), can be used free of charge during the park’s open hours. You can walk to the shores of the first lake. Because the elevated boardwalk is surrounded by an electric fence, you can safely stroll without worrying about brown bears. Because there are no steps and only moderate slopes, this course is accessible, even for sightseers in wheelchairs. The walking conditions differ from season to season. 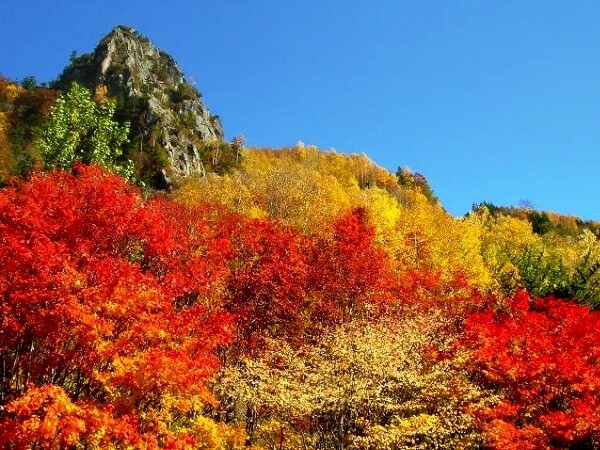 In October, autumn leaves season, the vegetation protection period lasts until October 20th. Only participants of the Shiretoko Field House lecture can walk along the promenade during this time. From October 21st through when the park closes, anyone can walk freely along the promenade. This course has a large loop (about 90 minutes：3 km≒1.86 miles) and a small loop (about 40 minutes：1.6 km≒0.99 miles). There are many plants and animals to observe in addition to the autumn leaves. Taking a shuttle bus from Utoro Onsen is highly recommended during the August. 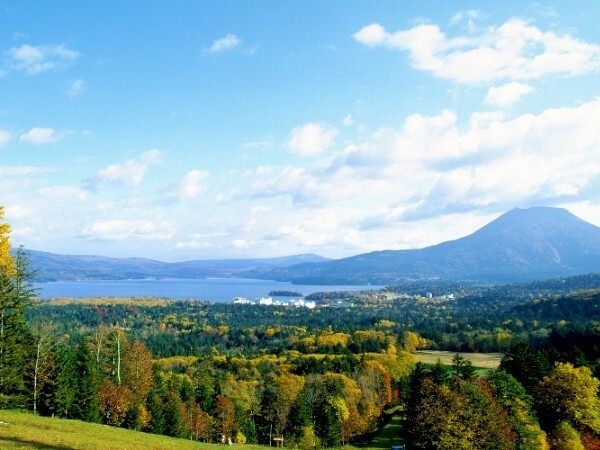 Lake Akan, the sight-seeing area that represents eastern Hokkaido, is located in the city of Kushiro. 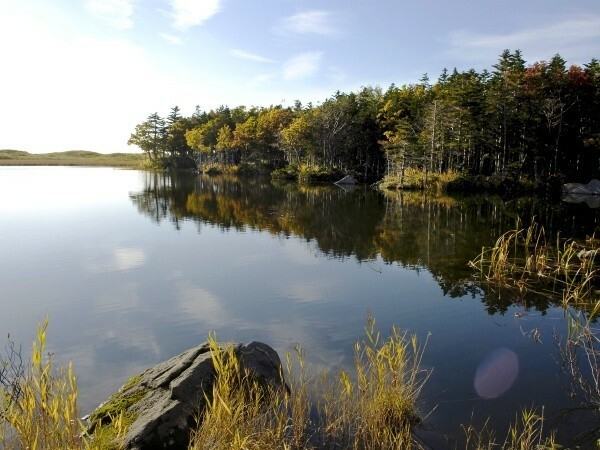 Lake Akan is known for being a special habitat for the protected species marimo. You can closely observe the marimo from the Marimo Exhibition Observation Center on Chuurui Island. *Marimo is a species of spherical algae. 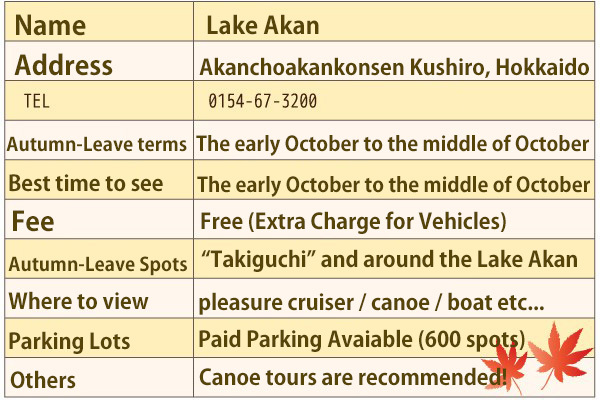 Lake Akan, which is famous for its autumn leaves, offers a pleasure cruise service. 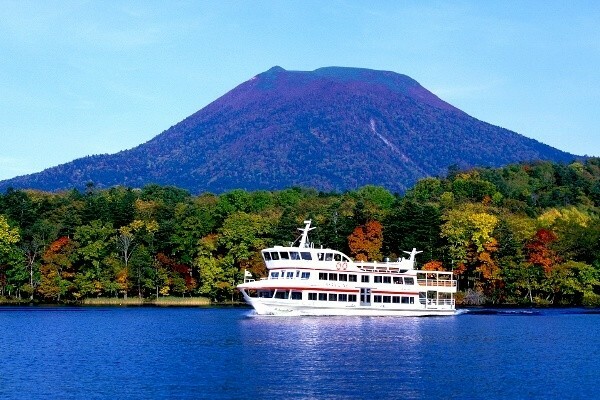 On this 85-minute group cruise, you can experience the most famous Lake Akan’s scenic spots “Takiguchi”, or you can observe the marimo from the Marimo Exhibition Observation Center on Chuurui Island. 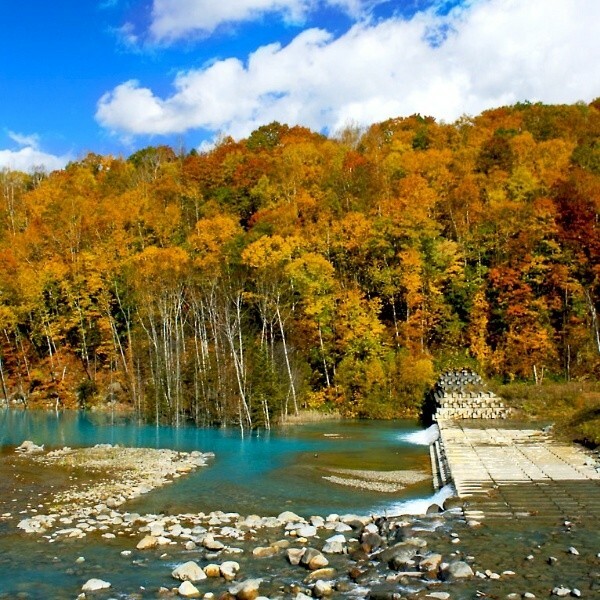 You will be able to experience Lake Akan’s autumn charm to your heart’s content. 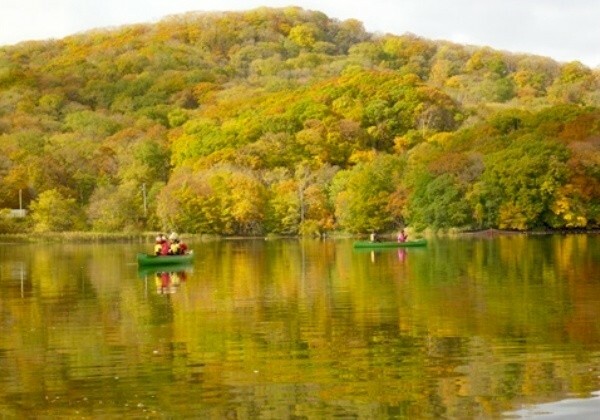 You can fully enjoy the beauty of Lake Akan and surrounded by the stretch of primitive woods by Canadian canoe tour. 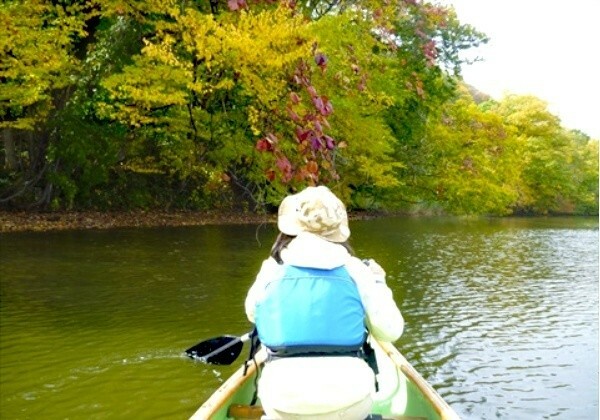 All of these canoe courses, sponsored by the Akan Nature Center, allow you to experience the autumn charm of Lake Akan. For example, on the most popular “Adventure Course”, you can explore the woods and satisfy your adventuring mood. If you’re lucky, you might even come across a precious wild bird. 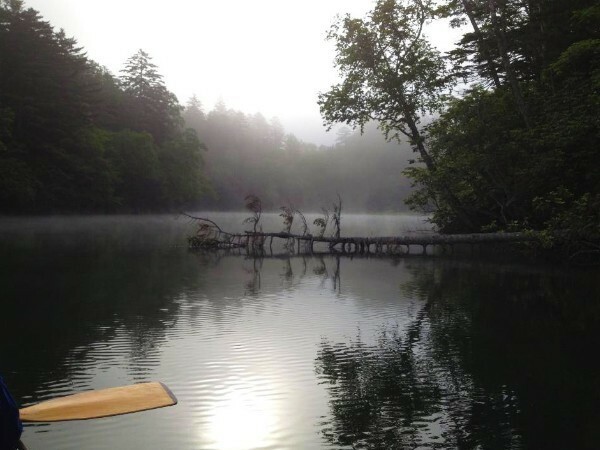 Or you can take the early morning “Private Canoe Tour”, which lets you reserve a canoe for just your group for the entire day. You can enjoy the indulgent experience of leisurely exploring an uninhabited Lake Akan. On an early autumn morning, try experiencing Lake Akan’s views from the lake with no other tourists around. Bus : 「Marimo sub-express Sapporo Go」(Sapporo 10:30 ･Minami Chitose 11:30・Shin-Chitose 11:50⇔Lake Akan Onsen 17:00 ) is available everyday from April to October. You need to make a reservation 5 days ahead before you ride this bus. *Other than this, Akan Bus is avaiable from Kushiro Station (120 minutes ) and Kushiro Airport (80 minutes). Please click Akan Bus Official Website for detail! In the Ainu language, “niseko(an)” means “steep cliff” and “nupuri” means “mountain”, so “nisekoannupuri” means “mountains with steep cliffs and a river underneath”. 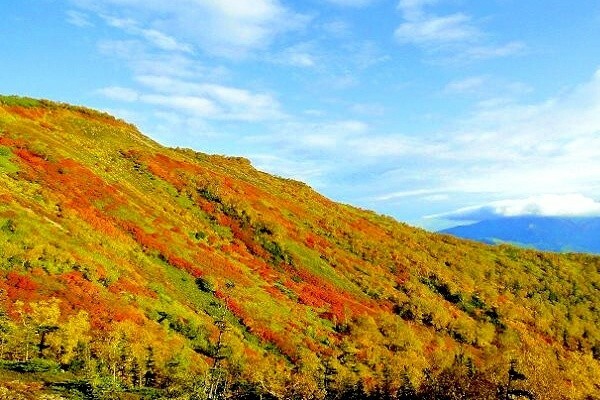 You can enjoy abundant nature here by walking around the Niseko-Shakotan-Otaru Kaian Quasi-National Park. 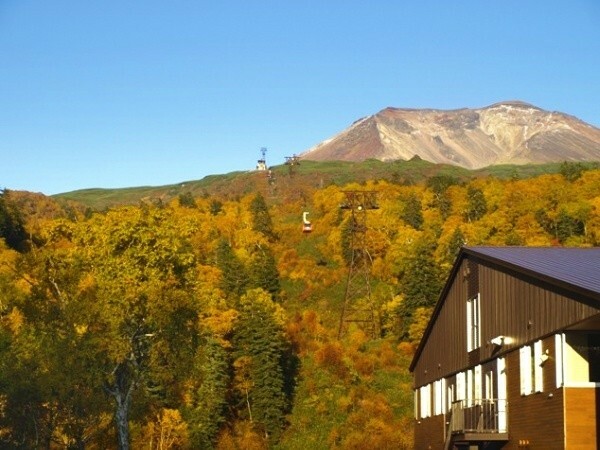 You can also gaze up at the magnificent Niseko mountain range with mountains as tall as 1,000 m. Furthermore, Niseko is also famous for its autumn leaves. 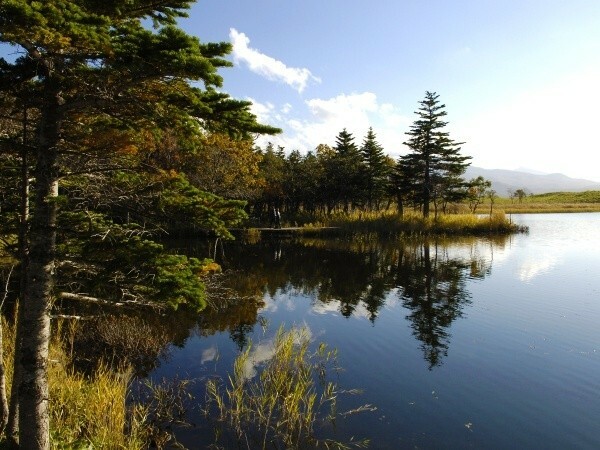 The most beautiful and mysterious of all the Niseko marshes is the Shinsen Marsh. 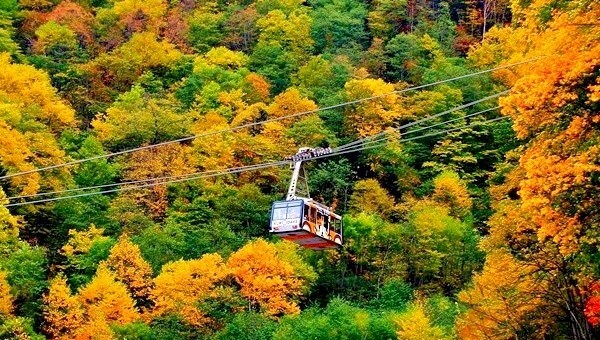 It’s famous for its autumn leaves and many tourists visit during autumn to see the picturesque views. 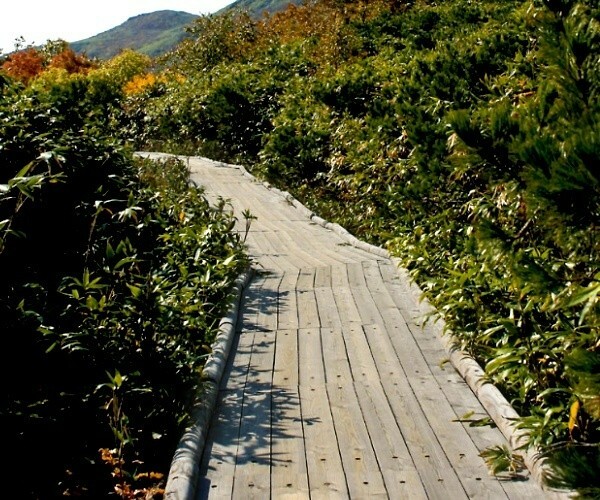 A boardwalk leads you from the parking lot to Shinsen Marsh, located 760 m(≒2493.4 ft) above sea level and surrounded by alpine plants. You can enjoy a nice stroll and reach the marsh in about 20 minutes. 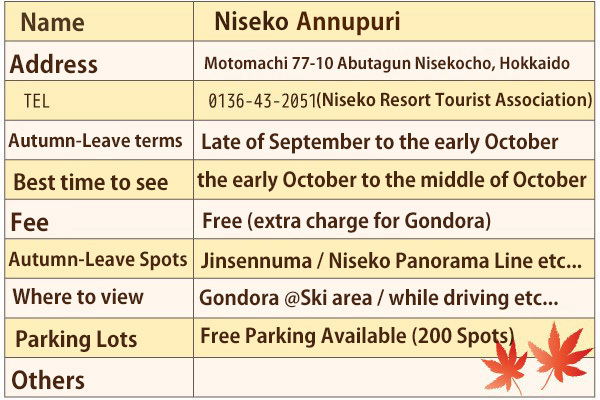 The site here that we recommend most for seeing autumn leaves is the Niseko Panorama Line on Route 66 that goes from Niseko to Iwanai. 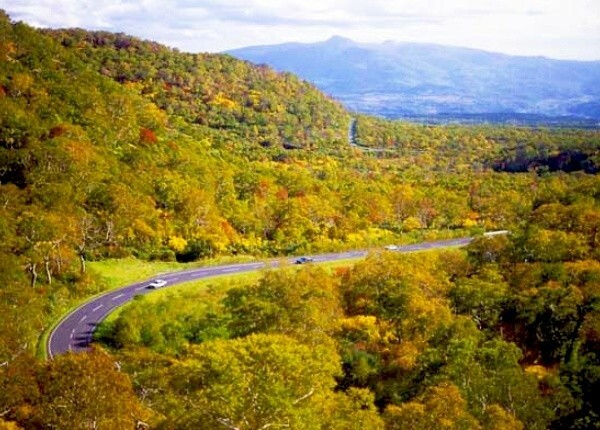 It’s extremely popular because it allows you to enjoy the autumn scenery while you drive. And on a clear day, you can admire the beauty of Mount Yotei. You can also take a 10-minute ride through the sky on the Niseko Annupuri Ski Resort Gondola to reach a site at an altitude of 1,000 m(≒3280.8 ft). 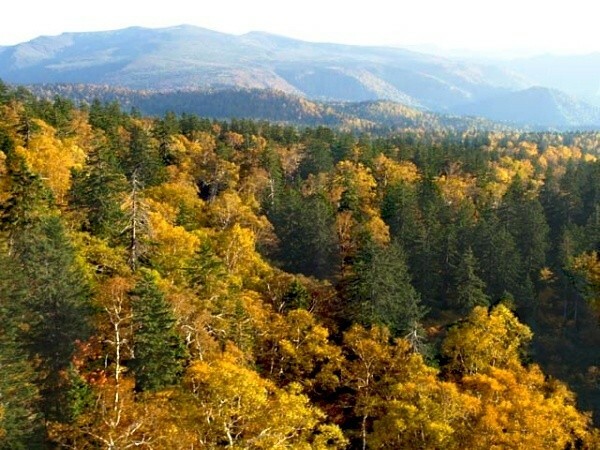 From the viewing platform, you can admire Mount Yotei’s autumn scenery. On a clear day, you can also see Lake Toya and Mount Usu. Train : it will take 40 minutes from JR Sapporo Station by express train, and 90 minutes more from JR Otaru station. Your destination will be JR Niseko Station. With its picturesque rolling hills, Biei makes you feel like you’re visiting another country. 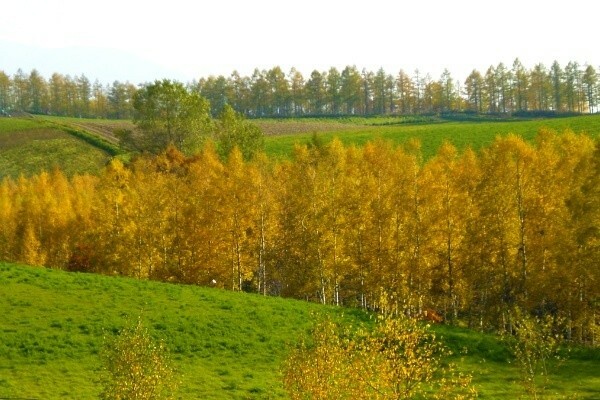 Seeing the hills covered in fresh greenery and blooming flowers in the early summer or blanketed in white snow is appealing, but even a quick glimpse of Biei’s autumn hills makes visiting worthwhile. The areas near the Biei Station and the Bibaushi Station are dotted with rental bike shops. You can feel the pleasant autumn breeze as you cycle through the autumn hills. 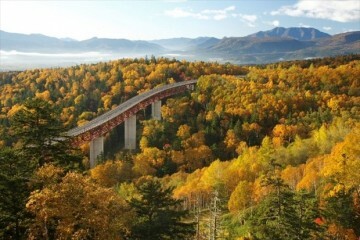 You can spend a calm autumn day here, dropping by a cafe or gazing at the picturesque scenery from the viewing platform. Incidentally,the hills have intense ups and downs, so experienced Biei cyclers recommend renting an electric bike. Rental bike shops in the Biei area can be found here. The cycling app can be found here. If you’re visiting on a weekend or national holiday before early October, we also recommend sightseeing on the Twinkle Bus, which departs from Biei Station. It’s a convenient 1-hour and 20-minute sightseeing course that lines up with the train schedules. 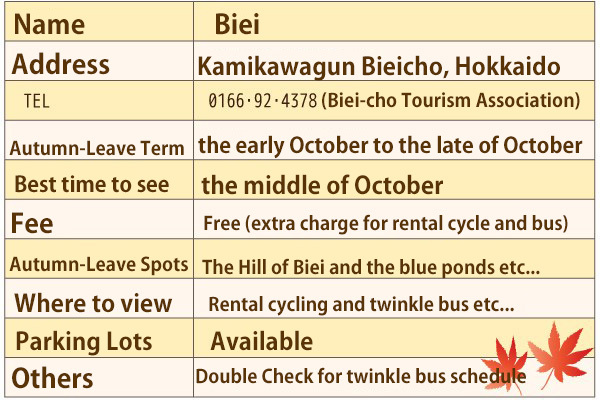 The bus tours all of Biei’s famous spots in a short amount of time and is a relaxing way to enjoy Biei’s autumn scenery. 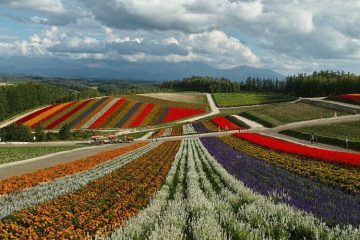 There is also a wonderful course from Biei that tours Furano. Details about the Twinkle Bus service can be found here. Shirogane, which is about a 30-minute bus ride from Biei, is home to a famous sightseeing spot. When chosen several years back as a wallpaper for Apple’s MacBook, the Blue Pond became instantly famous. You can enjoy the beautiful blue in every season, but the contrast between the autumn trees and the clear blue water is mysterious. 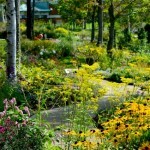 You can also get to the Biei River from the Blue Pond promenade. 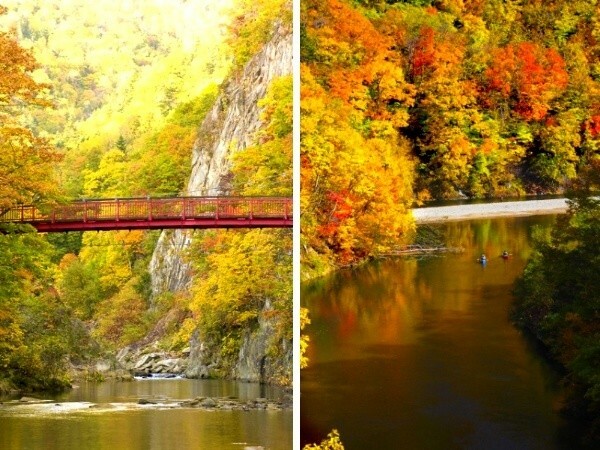 The contrast between the blue Biei River and the autumn leaves is a must-see. Jozankei Onsen spouts a commendable 8600ℓ(≒1952 gal) of water/minute. 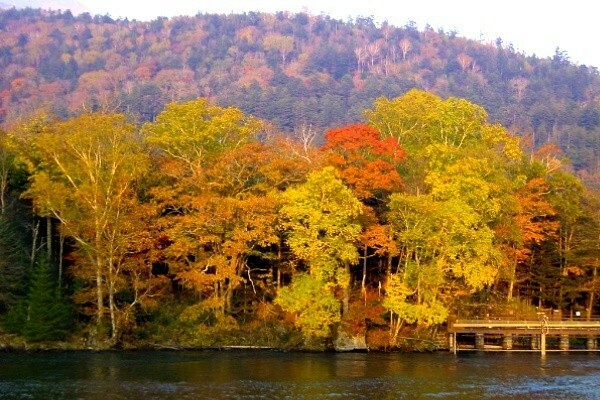 It is famous for its autumn leaves, the entire hot springs town transforms into a picturesque autumn view by October. 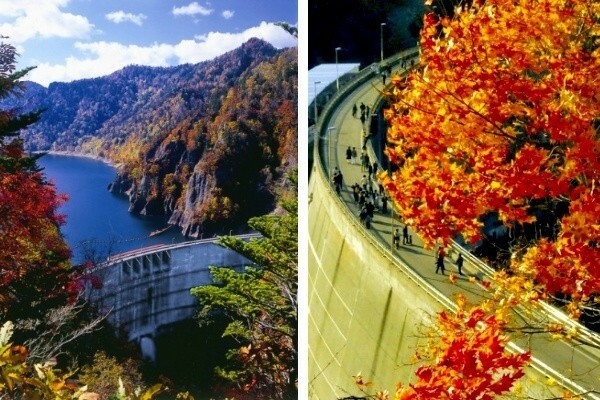 There are many places to see the autumn leaves, such as Futami Suspension Bridge (image on left) and the Nishiki Bridge and the Maizuru Water Pool (image on right). 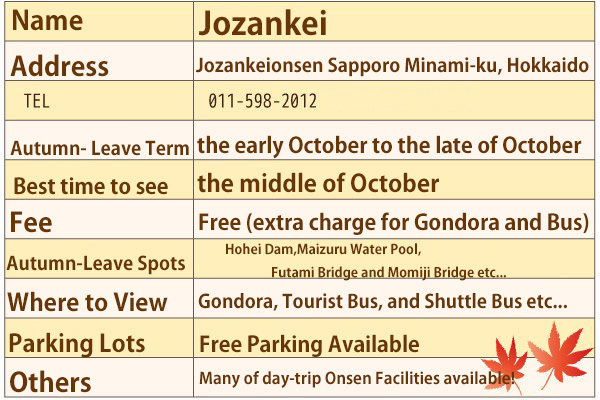 During the period of the autumn leaves, a sightseeing gondola and bus are available, or you can walk. It’s a recommended site with lots of promise. 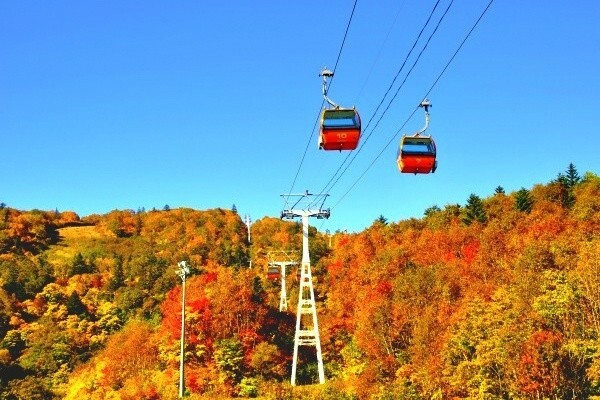 You can ride the Sapporo International Ski Resort’s sightseeing gondola between the end of September and the middle of October and admire the autumn leaves from the sky. 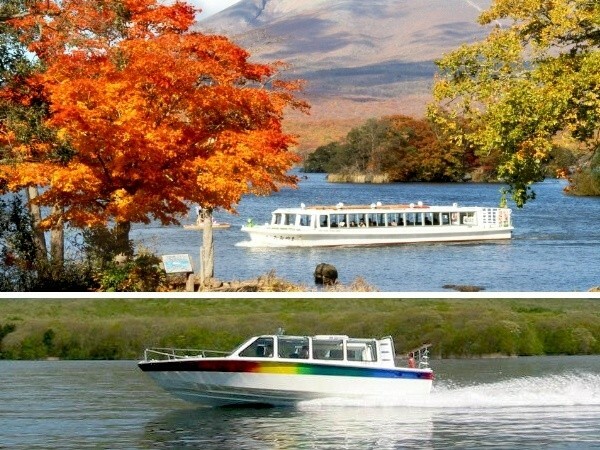 You can also take a shuttlebus tour to the Hohei Dam, another location famous for its autumn leaves, to enjoy a powerfully spectacular view. 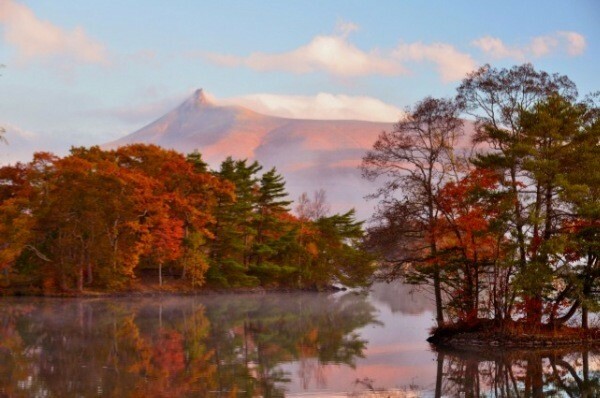 Furthermore, you can spend the day taking the Kappa Bus from Jozankei Onsen and experiencing the scenic autumn highlights with a local guide. Many of the Jizankei Onsen lodges offer one-day baths. 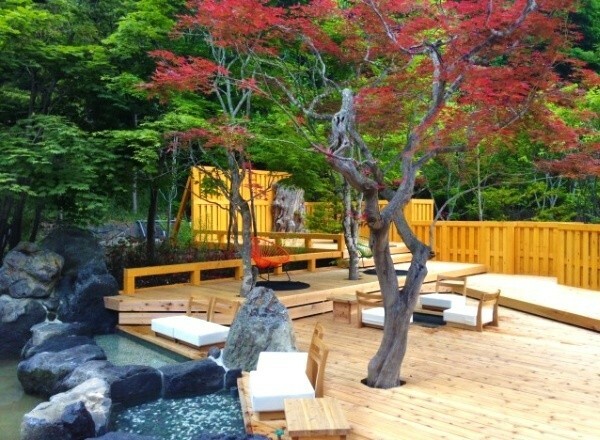 After sightseeing, submerge yourself in the hot springs and footbaths and leisurely enjoy the valley and autumn leaves! 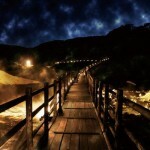 For a hot springs lover, this is an extremely indulgent trip. More information about the one-day bath can be found here. 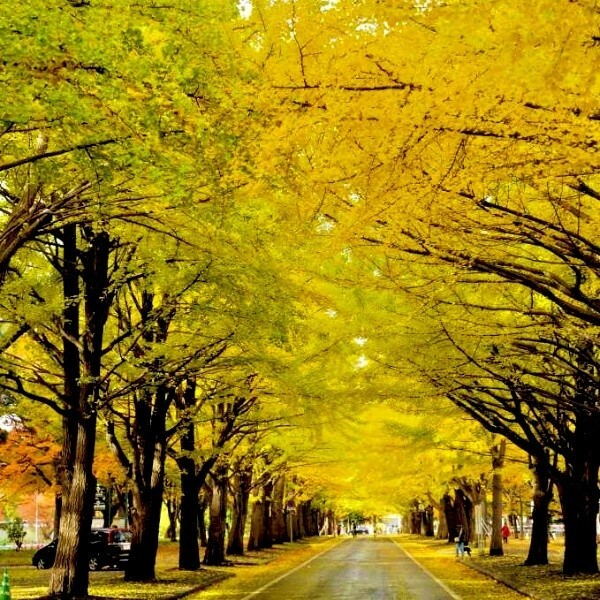 If you walk 15 minutes from JR’s Sapporo Station, you will have easy access to the famous autumn leaves of Hokkaido University’s campus. 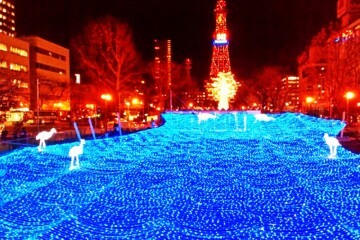 If you’re in Sapporo during this time, you must come and check it out. 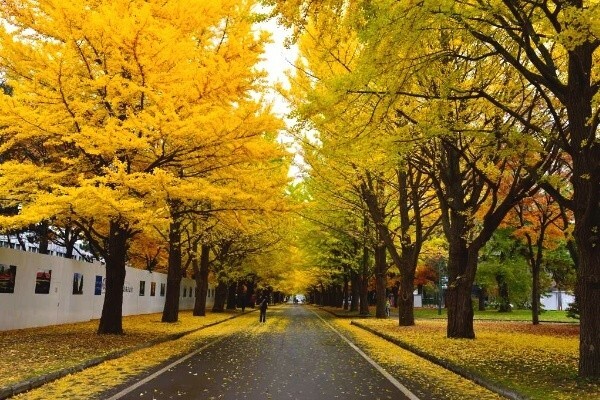 On both sides of the Kita-13 road is a 380 m(≒0.23 miles) line of 70 gingko trees. 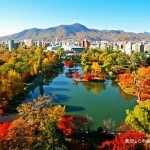 Many Sapporo citizens, as well as tourists from both in and out of the country, visit every year to see the beautiful autumn scenery. 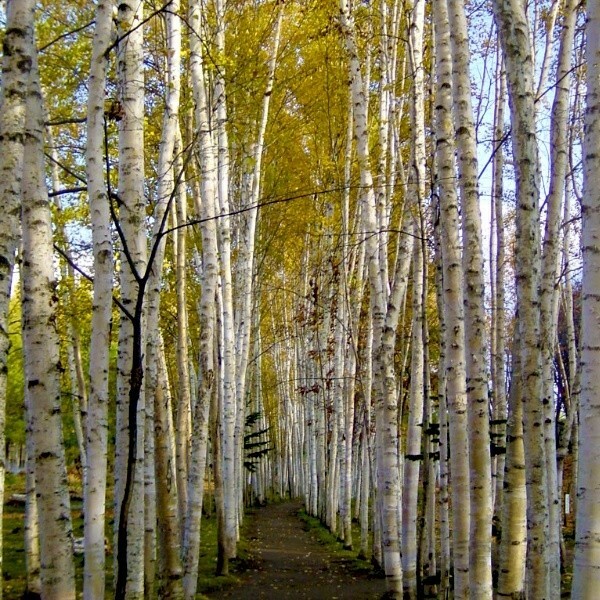 We recommend seeing the row of gingko trees and the row of poplar trees. However, vehicles are not allowed to enter the campus. When you come to visit, make sure to use public transportation. How was it? 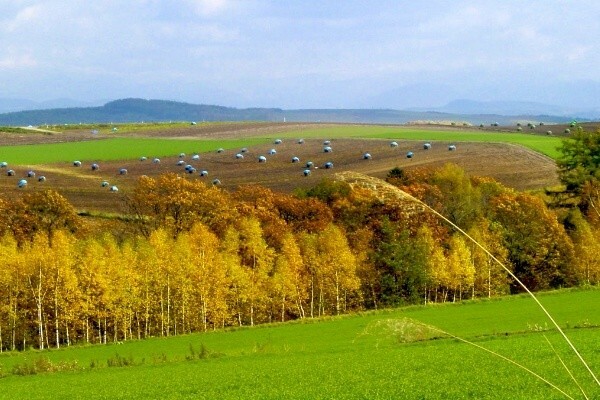 You can enjoy the autumn scenery all over magnificent Hokkaido, where the mountains and the lakes and the rivers and the earth are dyed in autumn colors. 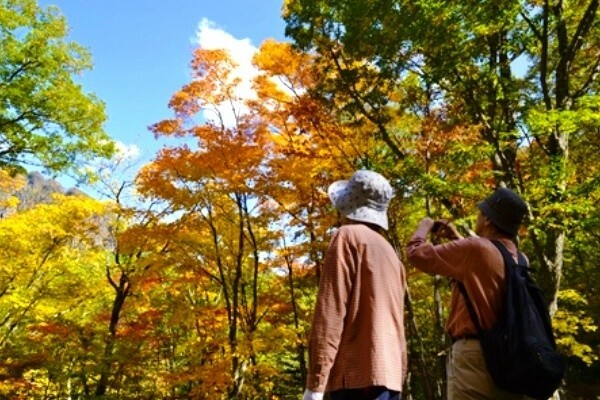 Plan a Hokkaido trip to see the autumn leaves this year. 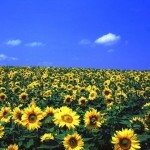 The picturesque scenery that awaits you will be remembered for the rest of your life.